We’d love your help. Let us know what’s wrong with this preview of Word Magic for Writers by Cindy Rogers. To ask other readers questions about Word Magic for Writers, please sign up. There is quite a bit of information in this book which I have previously used and been called out by editors for daring to put in a manuscript. On the other hand, this book defines what those methods and such are in a well-done way. Proceed with caution if you are above an eighth grade writing competency level. Antimetabole, repetition of identical words, is often a frowned upon practice. Antiphrasis is used in every mob-fiction story I've ever encountered, as they all have a character named "Ti There is quite a bit of information in this book which I have previously used and been called out by editors for daring to put in a manuscript. On the other hand, this book defines what those methods and such are in a well-done way. Proceed with caution if you are above an eighth grade writing competency level. Antimetabole, repetition of identical words, is often a frowned upon practice. Antiphrasis is used in every mob-fiction story I've ever encountered, as they all have a character named "Tiny" who... isn't. Chapter 11's ideas about writing colors, however, is useful and interesting. (Wine red and glittering gold instead of just red and gold.) The vivid verbs topic interests me, but the book made it dependent upon sports reporting, and was less helpful than I desired. However, a GREAT tip in the book: "The peppering of to be verbs, and of helping verbs such as do, have, can, may, might, must, ought, could, should, would deadens a paragraph or a scene faster than hail on a tin roof deadens the senses. Action verbs activate a scene every time." And there's a good review of show-don't-tell. There's a mention of embedding the setting into the action. The section on titles and using key words is spot on. Then there's a tip which is contradictory to several other writing how-to reference guides: "Chapter endings cannot all end with a dangler or a lure into the next chapter." This book is such a good resource tool for writers. Writers who feel they know all there is to writing are missing out. This book is so full of important information with writing examples to back up that information so even the most informed and savvy writer would benefit from owning this book. The author discusses the alchemy of language in her introduction that makes you think and nod your head at her ingenious insights. She continues on to break language down by discussing Wow! Where to start? The author discusses the alchemy of language in her introduction that makes you think and nod your head at her ingenious insights. She continues on to break language down by discussing devices, from alliteration to zeugma. The devices she covers includes sound devices to enhance a title or sentence. She discusses how writers love to list, which is true, especially about fiction writers, and she shows how this list is comprised usually of a magical three: a visual, aural, and symbolic appeal. To show this, she begins with asyndeton, which is a series without a conjunction, for example: "Charlotte's Web," by E.B. White. In this story, E.B. White made a list of interesting items loved by rats, pigs, and a girl. Included in this section, is a discussion about creating an effect of multiplicity by using just a few words. Along the way, the author provides tips or things to remember such as what coordinating conjunctions are. The author approaches the subject of trigger words and punctuation, providing exercises to clarify her thoughts and once again, you'll find tips to help you understand her thoughts. When she moves on to discuss polysyndetons, here and there and everywhere, to further discuss the sense of multiplicity in a seemingly opposite direction to asyndeton, she provides more examples that help to make her thoughts clear and precise. You get discussions regarding parallelism for balance with examples and tips to bring her point to a conclusion. At the end of the chapter, she writes her conclusions for you to ponder over. There's a section in this book that goes into word choices and writing techniques to create vivid images for readers by using vibrant words. She offers her point of view on wordiness as opposed to fewer words to say more and goes into your choices effecting implication and your writing style. She talks about hooking your reading audience, how to grab their attention through titles and headlines and the importance of creating memorable openings. In the end, Cindy Rogers shows you how to leave a lasting impression with your reader. I absolutely loved this book and the helpful information contained inside. Although many of the books I've reviewed as author tools, speak about grammar, this book aims more at writing novels/stories and is written with the idea that the reader knows something already about grammar and the basics of writing. 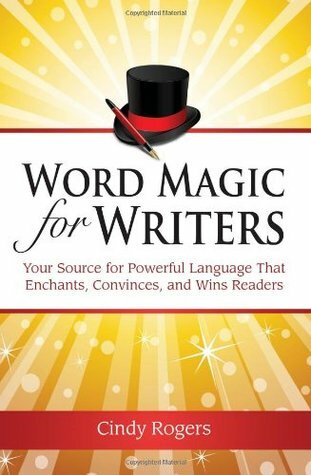 Word Magic for Writers by Cindy Rogers is not just a must-read for writers seeking to polish their craft. It is a great resource for book readers who want to understand more fully what makes a book well-written, what helps to increase the power of that book's language. Ms. Rogers describes in detail the devices, word choices, and techniques that "leave a lasting impression." You may not know exactly why you admire a certain book, but Word Magic for Writers will help to define the qualities of th Word Magic for Writers by Cindy Rogers is not just a must-read for writers seeking to polish their craft. It is a great resource for book readers who want to understand more fully what makes a book well-written, what helps to increase the power of that book's language. Ms. Rogers describes in detail the devices, word choices, and techniques that "leave a lasting impression." You may not know exactly why you admire a certain book, but Word Magic for Writers will help to define the qualities of the language that inspires you in that book. The examples are well chosen and memorable. How can you forget this example of onomatopoeia from Jerry Spinelli's Maniac Magee, "A faint tiny noise. A rattling. A chittering. A chattering. And getting louder - yes - chattering teeth. Arnold Jones' teeth. They're chattering like snare drums"? And what about this example of paradox from Charles Dickens's Bleak House,"He is an honorable, obstinate, truthful, high-spirited, intensely prejudiced, perfectly reasonable man"? And the metaphor in John Kennedy Toole's A Confederacy of Dunces, "The sunglasses blew smoke all over the old man's cards"? This book has been on my writing shelf for to many years, each year I resign to crack it open and finish it. The book is great thus far and provides exercises for the reader to strengthen their writing craft. What I need to do is block off an hour each day and "just do it!" To me the book is like being in a classroom and requires attention and thinking, thinking, thinking. It is a well thought out book and I differently would recommend this to any writer who wants to improve their craft. I don't think this is a book to read all at once. It is advice to absorb and use over time. A book for reference , to keep dipping into and refreshing your writer's mind.